VP, Integrated, Sealed Bearing, Tapered 1-1/8" to 1-1/2"
Kenda Kwik Seven-5 Sport (Ebike Rated), 27.5" x 2.2"
To run the forums, host the website, and travel, I charge a universal service fee for my reviews. This review was sponsored by Aventon. My goal is to be transparent and unbiased, this video and written review are not meant to be an endorsement of Aventon products. Aventon (inspired by the Spanish words for “to lift up”) comes from a rich background in performance track and fixed gear cycling. Products like the Cordoba and Mataro have been ridden on the world stage at the highest level, including races like the Red Hook Crit. 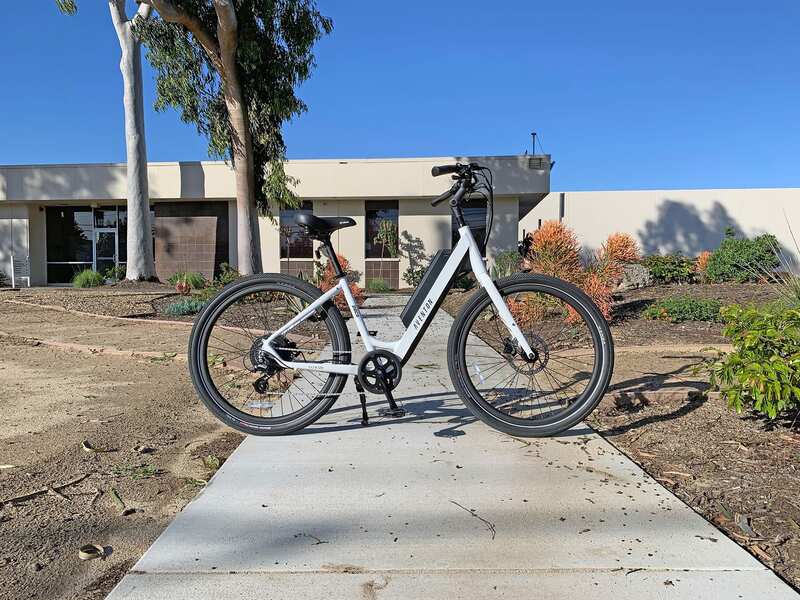 Their founder, JW, sees the benefits of electric vehicles for fitness, recreation, and transportation. 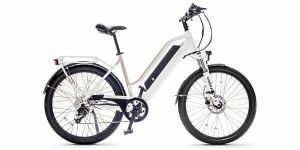 They are looking to bring their past manufacturing expertise to the new Pace ebike line and the 500 is a great example of this. 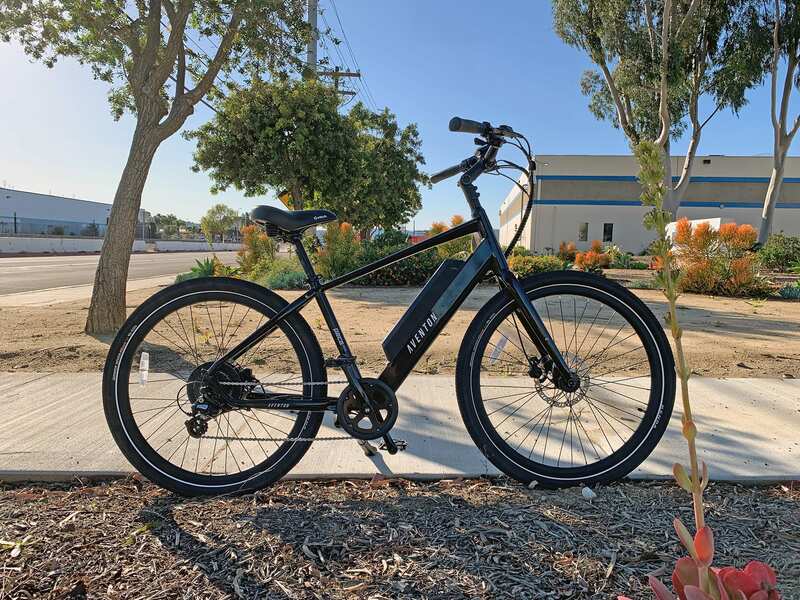 The Aventon Pace 500 is an affordable yet powerful and versatile ebike which aims to give more bang for your buck versus other value priced offerings. It comes in both a step-through and a high-step, each with their own sizes and colors. The step-through comes in White and “Celeste” (a seafoam green) while the high-step comes in Black and “SoCal Sand” (a kind of brownish color). Similarly, you can find the step-through in Small and Medium sizes, while the high-step is available in a Medium and Large frame. For $1,399 there is surprisingly a lot to look over, so lets get in a little deeper. 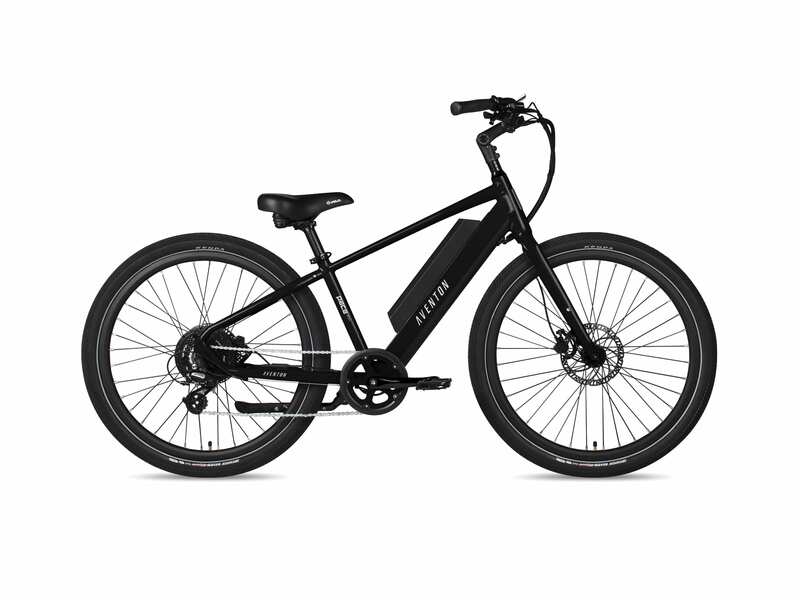 The Pace 500 is a comfortable and upright bike with a relaxed position for leisure riding or commuting. 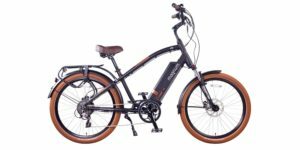 That comfort comes from a seat tube that is further back, adjustable angle stem, swept back handlebars, and locking ergonomic grips. You also get this Velo comfort saddle with rubber bumpers underneath and some nice fairly thick high volume tires (27.5” x 2.2”) which make for a wider attack angle. 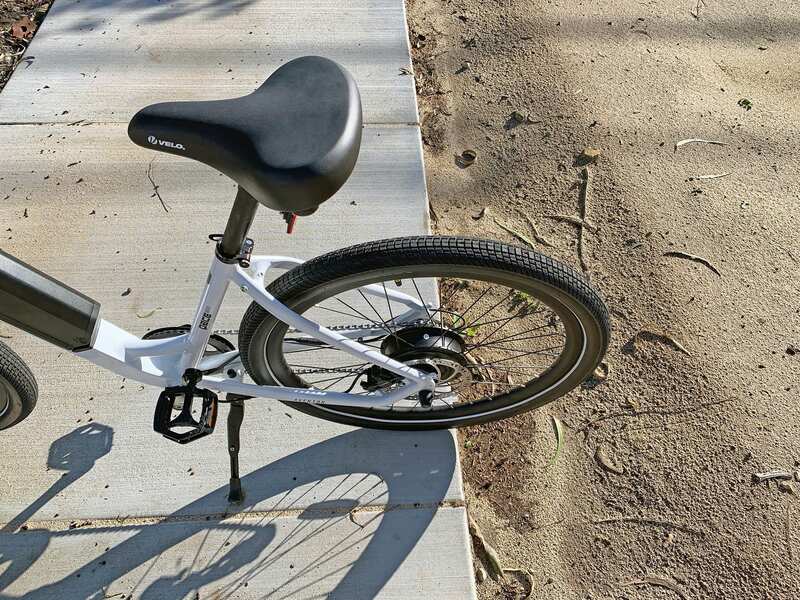 Unfortunately, there is no suspension fork or seat post, but I am sure most wouldn’t be surprised given the cost of the bike. 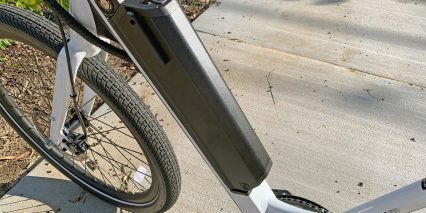 However, they do have a 30.4mm seat post on the step-through and 31.6mm seat post on the high-step if you want to swap those out with a cushier option. Also, the head tube itself is tapered, which is nice because that will open up some fork options for those looking for an upgrade. 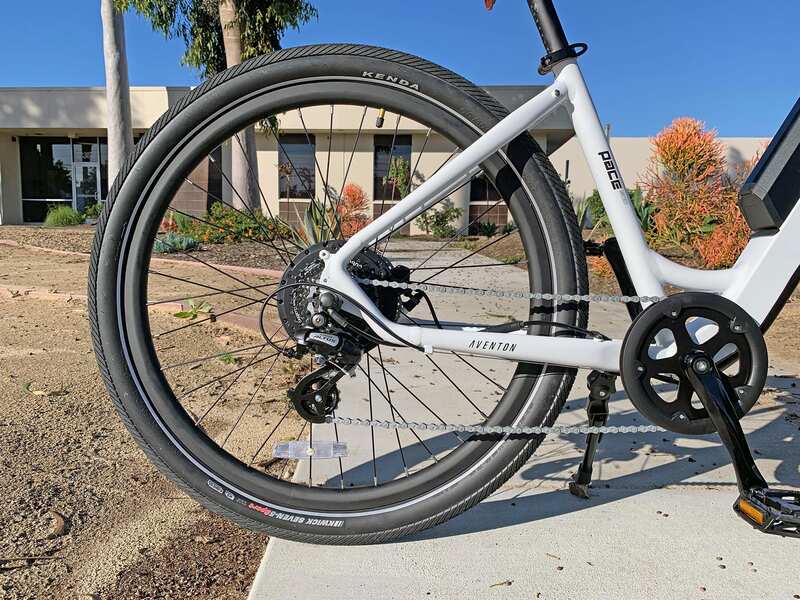 The bike itself is fairly lightweight with an aluminum alloy frame and fork, coming in at 49.8lbs total. Its a handsome bike with wrapped wires, some internally routed cables, and extra gussets adding a lot of attention to detail. 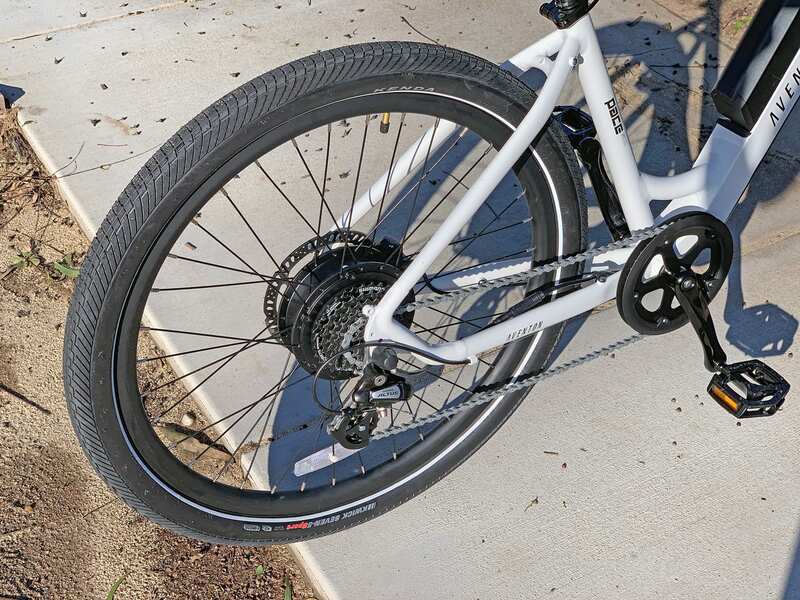 Other features include rear rack bosses, fender bosses, kickstand (although it is centrally mounted which could produce pedal lock when reversing), reflective sidewall stripped tires, plastic chain guide, and a semi-intergrated downtube battery. The real big wins on this bike though is in it’s performance. The Aventon Pace 500 sports a powerful rear hub-drive motor with both pedal assist and a throttle. 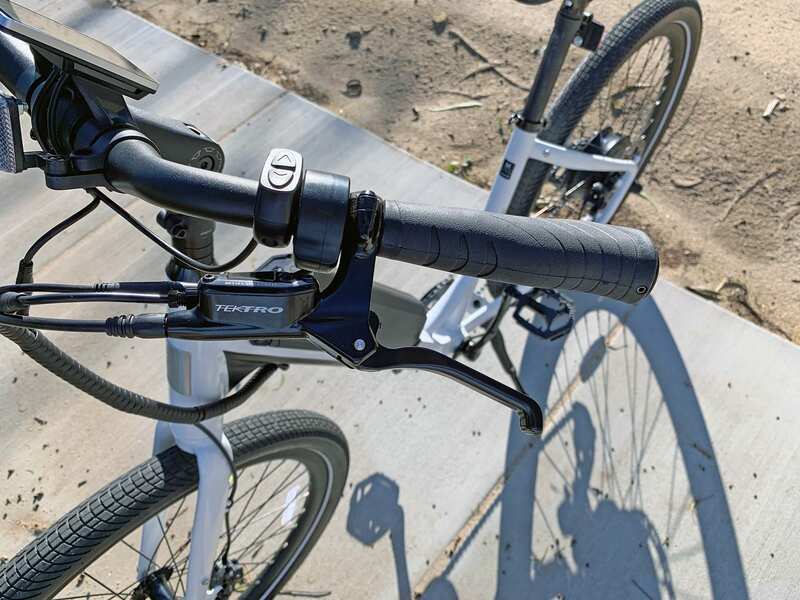 The throttle is rated for 20mph while the pedal assist will get you up to 28mph. 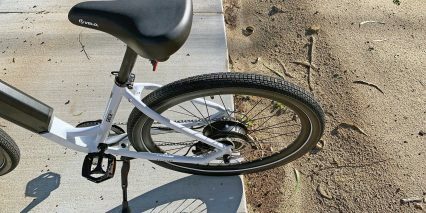 To match that 28mph top speed, they added on a satisfying set of hydraulic disc brakes complete with motor inhibitors. Driving the Pace 500 is a Shengyi 500 watt planetary gear hub motor. 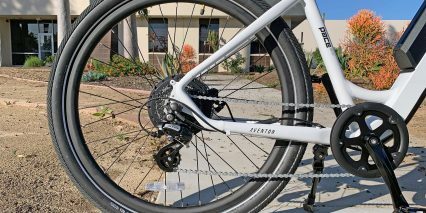 The 9lbs motor offers 60nm of peak and since its planetary geared, will freewheel a little more efficiently and not cause the drag you get from gearless motors. 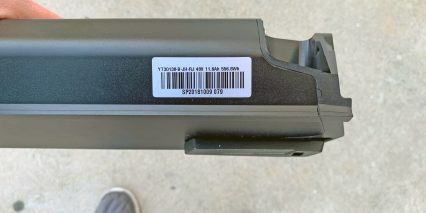 However, since it is a sealed 12 magnet cadence sensor, you will get a little more of that “on-off-on-off” feeling as you ride it. 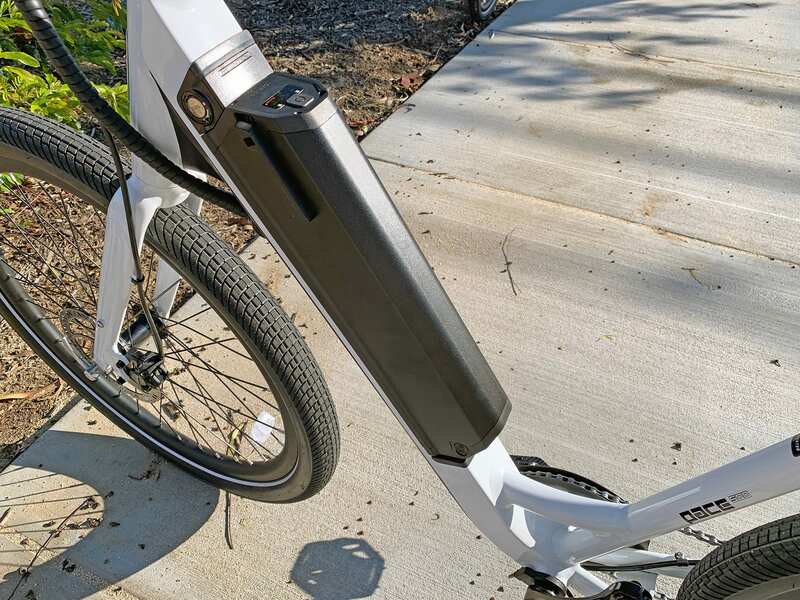 The pedal assist is capable of getting you up to 28mph and the sealed sensor means no gunk or debris getting lodged inside which is a nice feature. You also can power the bike via a trigger throttle. 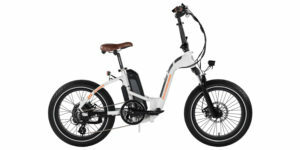 The throttle is variable speed and is capable of a 20mph top speed, but will only engage with 1 full pedal rotation. I try to get a good example of this in the review video, so make sure to check that out if you want to see it in action. 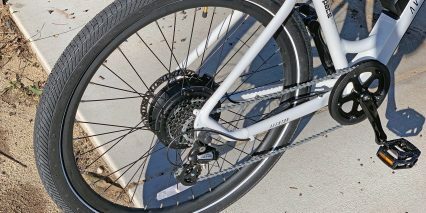 On the mechanical drivetrain of the bike, you will find an 8 speed Shimano Altus sprocket. 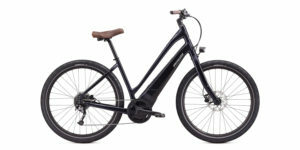 Altus is a step up from entry level, so its nice to see them kick things up a notch on a value priced ebike. Along with that is a 11-36 Shimano cassette and a 42 tooth chain ring. Controlling everything is a set of trigger shifters (one way high, three-shift low) with a windowed gear display. As mentioned before, we have a nice set of Tektro HD-T825 hydraulic disc brakes with 180mm rotors and three-finger levers with motor inhibitors. 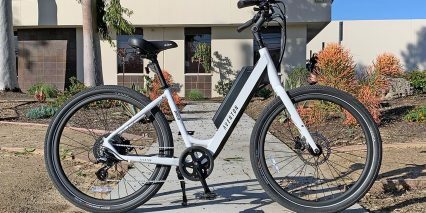 Powering this high speed bike is a 48v 11.6ah lithium-ion battery with Samsung cells. 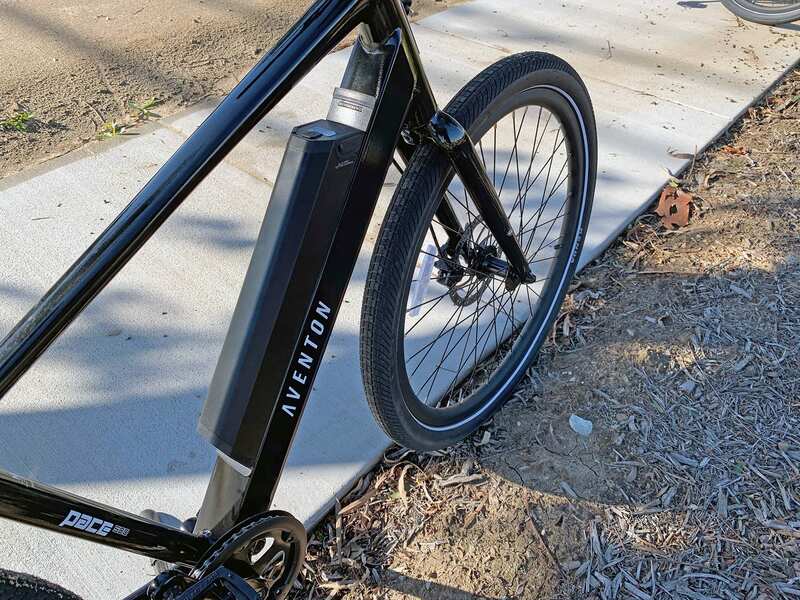 The battery is running at 556.8 watt hours and weighs a total of 7lbs. 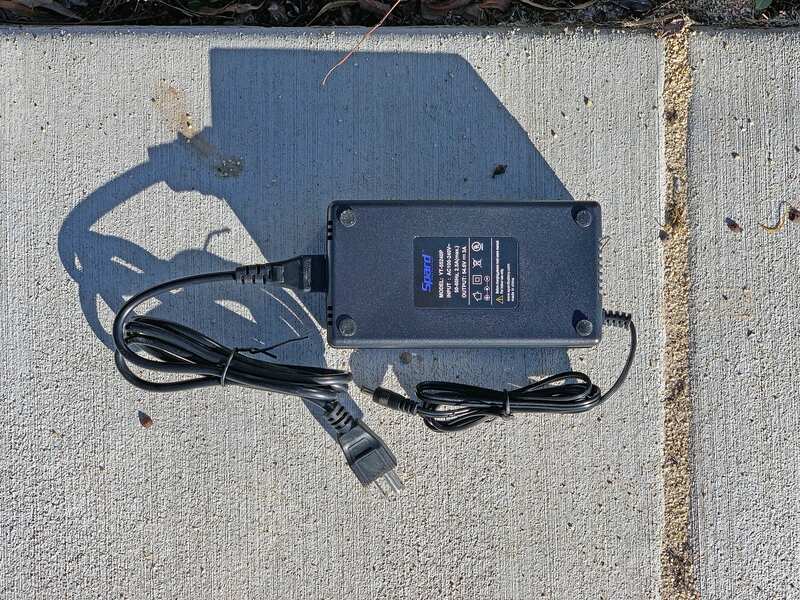 There is a USB port on the side, but it is not for charging, but rather for service diagnostics which serves a great purpose, but looking at it does serve as a constant reminder that a USB charging port may have been a missed opportunity. 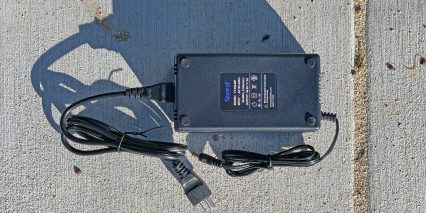 The charger is 1.3lbs and puts out 3amps of charging power, a bit faster than the standard 2amp chargers we are used to seeing. 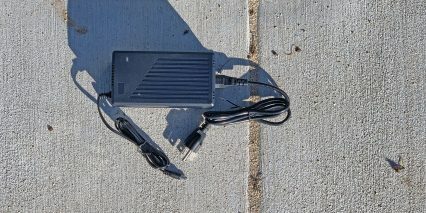 The battery is secured with lock and key and can be charged on or off the bike, but I do recommend charging indoors. 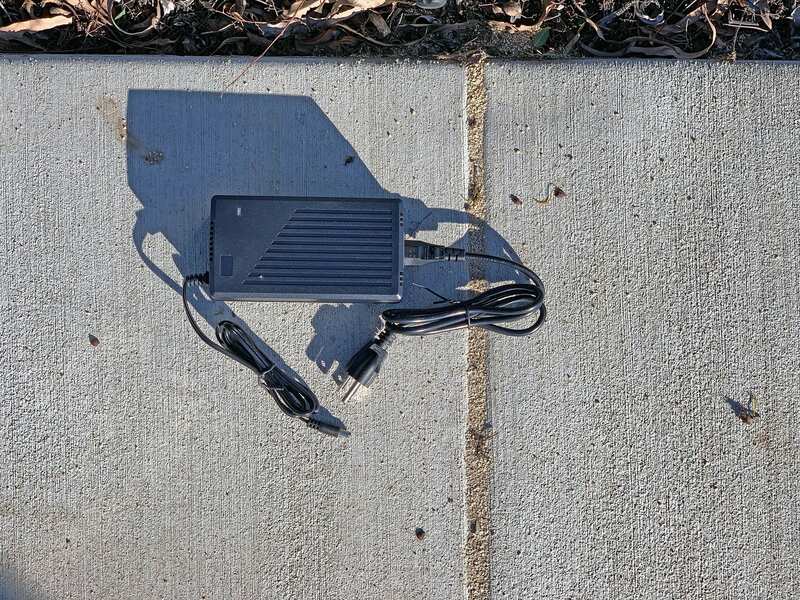 To really care for this and other lithium-ion packs, I have heard that storing in a cool dry location vs. extreme heat or cold will extend the life, and try to keep it about 50% full when not using for long periods so you won’t stress the cells. Try not to let it run down to zero, because that’s really hard on the cell chemistry. The cockpit controls are great, its nice to see levers for shifting instead of the usual thumb shifter. Most of this is possible since the throttle is on the left along with the display controls. On the right is your shifting levers as well as a gear display window. 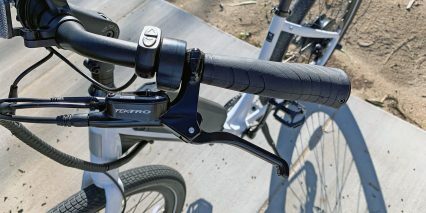 Right in the middle of the handlebars is the large and easy to read display. 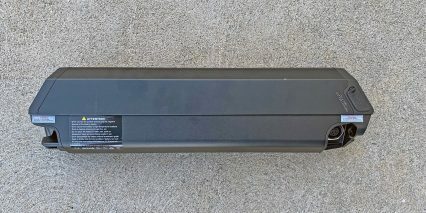 The display does have an adjustable angle, but is not removable which can sometimes leave you feeling insecure when parking it or leaving it to the elements. 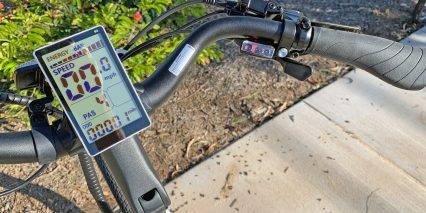 The display is grayscale and features a backlight for nighttime riding. 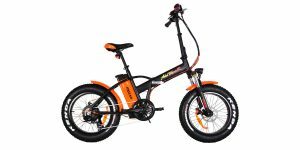 To start the bike, press power on the battery, hold the M button to turn on display. The large display offers a wealth of information starting at the battery levels. The battery infographic is shown in 10 separate 10% intervals which does a better job of leaving guess work out compared to other bikes with 33% or even 20% steps. You can scroll through several modes of pedal assist (1-5) and can use the throttle on any as long as you get that pedal rotation in. 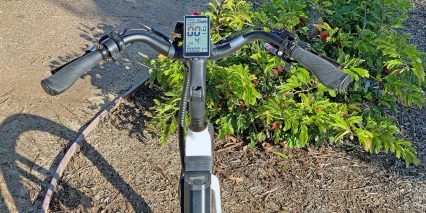 Other display options include odometer, trip A, trip B, battery voltage, and a timer. Also, if you hold down the down arrow, you can engage a walk mode. There is a deep dive menu if you want to play with other various settings. Hold up and down arrows for a couple of seconds to initiate this menu of settings. 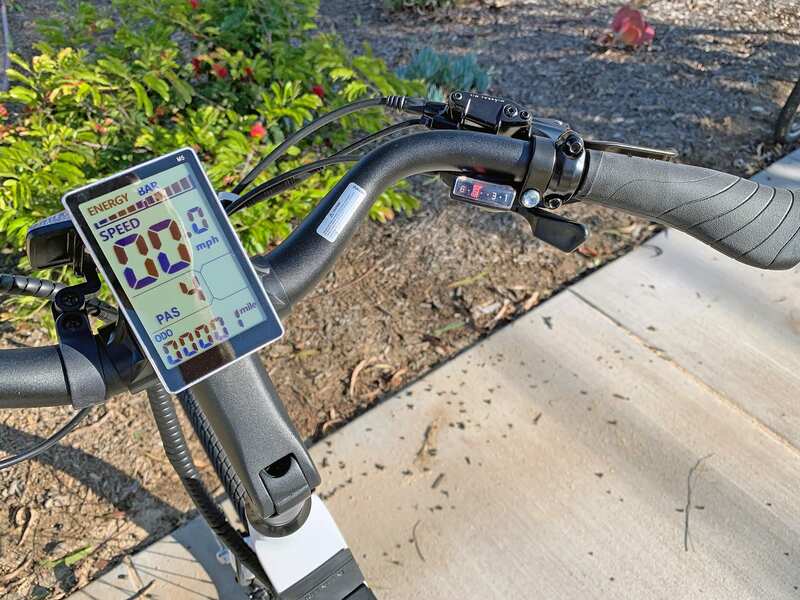 Once inside, you will have access to backlight settings, unit readout, wheel size configuration, and top speed. The top speed is really since since out of the box it is a Class 3 bike. If you want to lower it to a Class 1 or 2, you could change some of the settings and even extract the easy to remove throttle to comply with certain jurisdictions. To exit this menu, hold M to leave. Its hard to knock a bike with both hydraulic brakes and a 28mph pedal assist that only cost $1,399. So much attention to detail is given but you can’t make a bike to please everybody so there are some tradeoffs to take into consideration. Little things here and there would be issues with the derailleur and some of the wires in the rear being a little exposed. This could be problematic if the bike is damaged in shipping or even dropped. 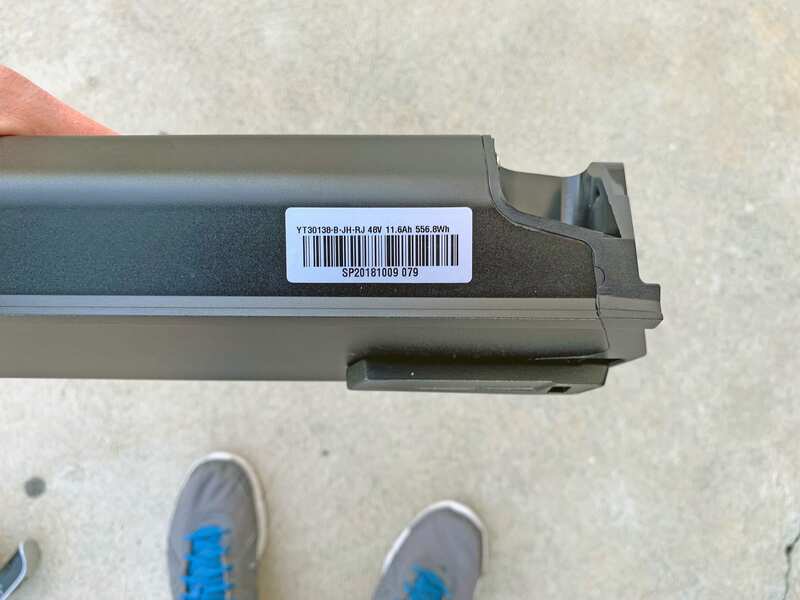 There is no slap guard in the rear, so the chain could knick the paint a bit, something that could annoy you especially if you got a color like Celeste to stand out. I recommend covering it with some box tape or getting an aftermarket neoprene slap guard on Amazon. Its nice to have fender and rack bosses, but unfortunately no bottle cage bosses this time. 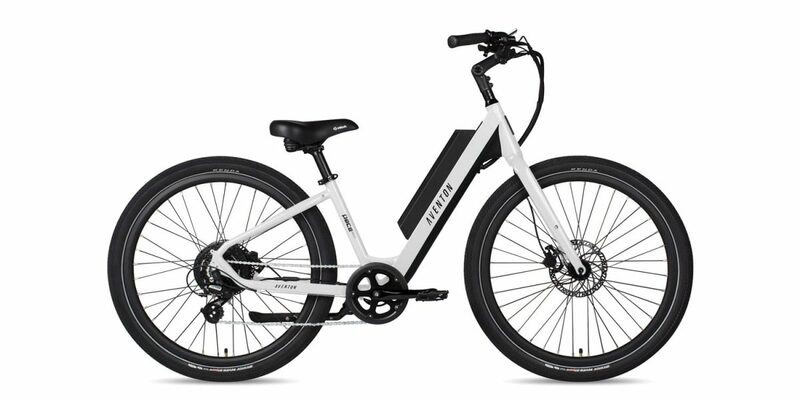 Also, for a high speed bike with a powerful battery, I gotta say its a little disappointing they didn’t add battery intergraded lights for either the front or back. The biggest tradeoff however, would have to be the assembly. The bike is made to order through dealers or online, but if you have it delivered to your home, do be prepared. It can take about an hour to assemble, so make sure you have some tools handy (although they do include some) and some free time. To help remedy this, Aventon does have a YouTube video that details assembly instructions for those looking for some extra help. Of course, you can also have your local dealer do it, or pay a local mobile bike service as well. 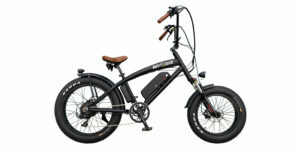 To be honest however, when you look at the big wins like the 28mph motor, high capacity battery, hydraulic brakes, and comfortable ride, and then look at all the finishing touches like the 1 year warranty, thicker reflective tires, locking grips, and upgraded (from entry level) components, its amazing that this bike comes in at such a great price. 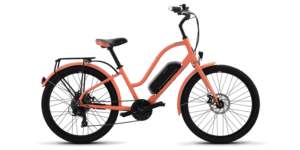 Tradeoffs considered, this bike would probably pleasantly surprise anyone looking at the more affordable options. A big thank you to Aventon for inviting me out and letting me see their bikes and their factory. Nice review. 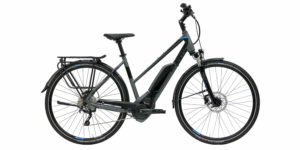 The big advantage of this Pace 500 is it is NOT speed limited to just 20 mph, providing great assist to well over 20 mph. 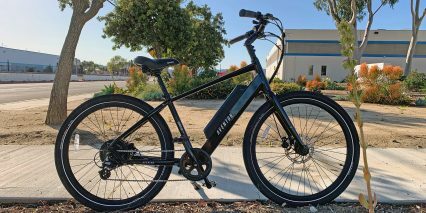 It’s got key features and build quality of ebikes priced over $1800. LED Lights are very easy to add, and usually you can get much higher lumen power than the integrated lights on ebikes priced below $2000. 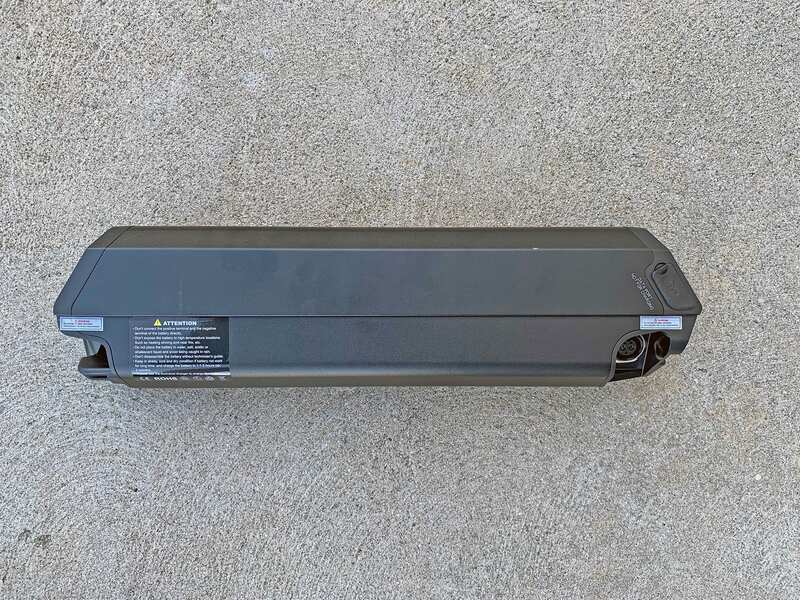 Plus they wont run down your main battery. 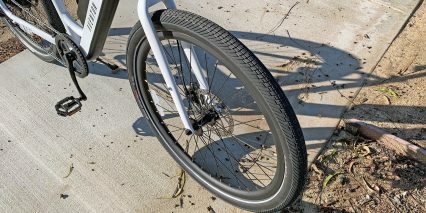 Add a nice NCX suspension post, and this will be a super comfortable ride with plenty of power. The display is super easy to read, with large and clear numerals. 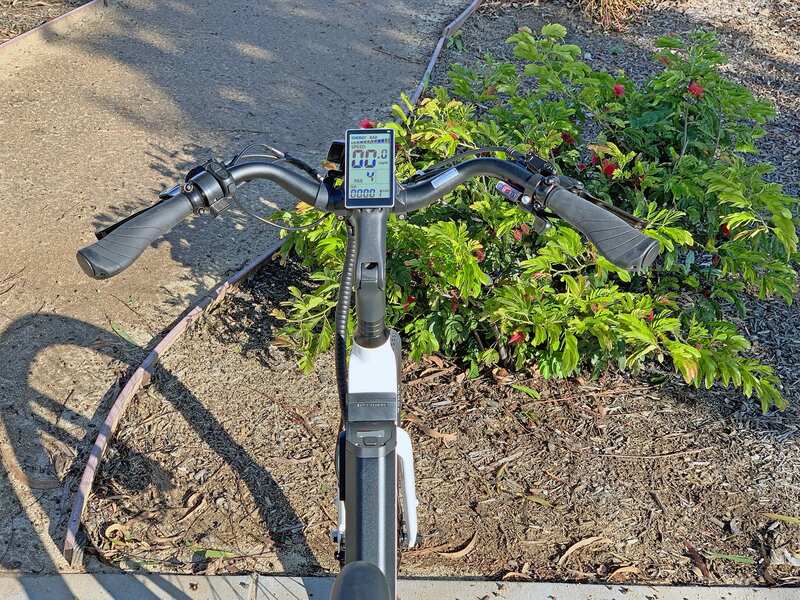 The cadence sensor being enclosed is very important, and not like the cheap ones found on many of ebikes you order on-line, as those can be kicked, broken off, or just fail work properly. 12 magnets is plenty, and with sinewave controlled motor, and controller, acceleration seems very smooth. The optional stuff like racks, or suspension seat, or lights and fenders are very easy add on’s, and can be done to suit personal tastes and needs. Assembly looks intimidating at first, but the protective packaging is very good, well thought out, and a lot less likely to incur shipping damage, than many others I have seen. It can be assembled in under 45 minutes, and watching their video is a great help. Put on handlebars first, flip it over while using a pillow to protect the handlebar/display, and put the wheels/derailleur on while its bottom up. Or if you have a stand all the better. 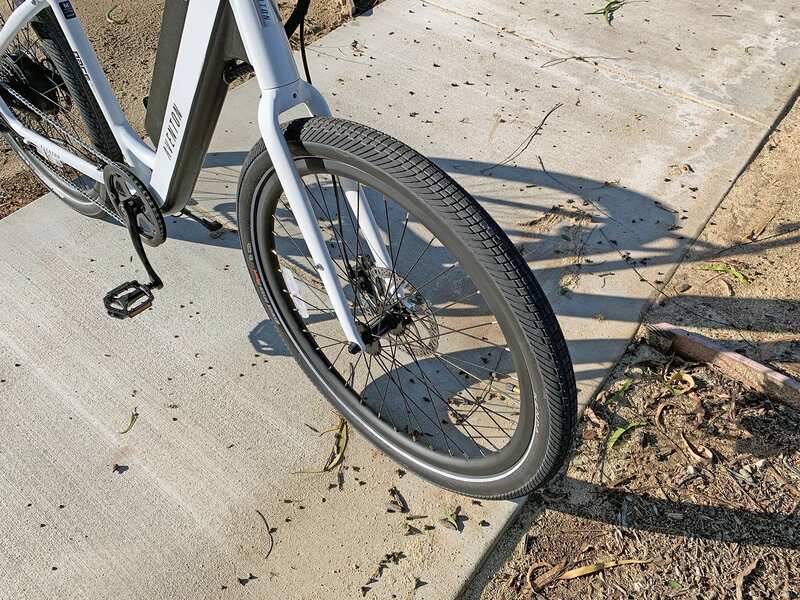 Another substitute is if you have a WorkMate Bench, remove the seat from the post, and then flip the bike upside down, inserting the seat post in between the clamping section, and place a towel on the surface to protect it. Very easy to then do the rest of the assembly. On the otherhand a bike shop would find this to be a piece of cake to assemble, and should not charge much at all. Thanks for your feedback Mike! 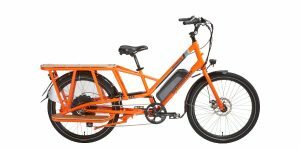 I haven’t tried the BikeaRoo seats yet, but the price looks great! 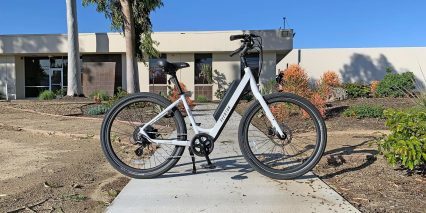 The Aventon Pace 500, both this step-through model as well as the step-over model, have been very popular and have been selling fast since we added them to the lineup of e-bikes on our site. We love the beautiful design and look of this bike, along with the quality and care that has gone into it. Definitely appreciate the detailed review and info offered, here. Thanks! Awesome! Thanks for the input and feedback on this model. Sounds like it’s doing well for your shop. Where are you guys located? 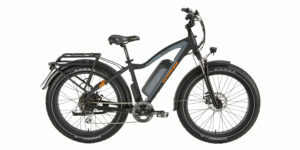 We are based out of Columbus, OH, though our business is online only at ElectricBikeZone.com. 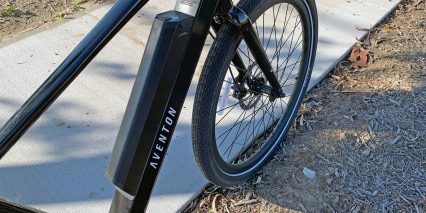 Aventon now offers a 14 AH battery in addition to its 11.6 AH battery, for increased range. Their battery prices are more reasonable than other brands too. Samsung quality! 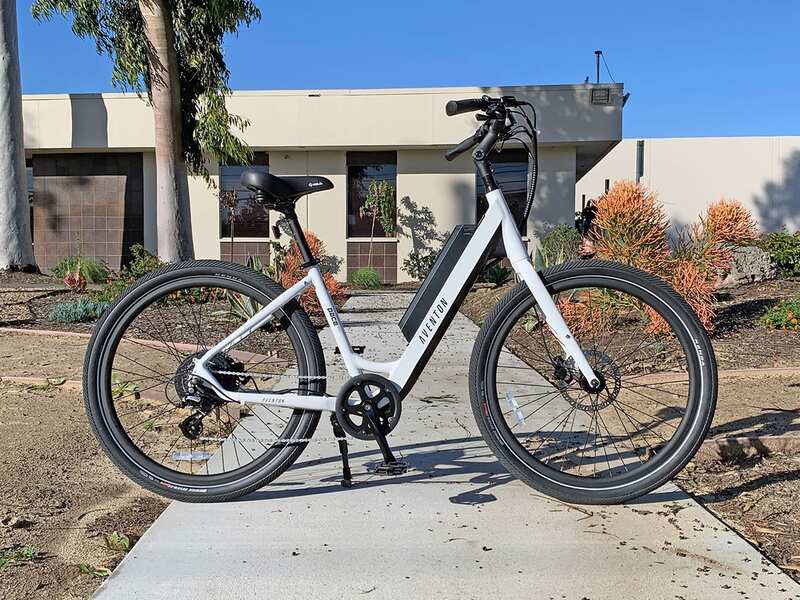 My Aventon Pace 500 ebike seems adaptable to any type of riding. 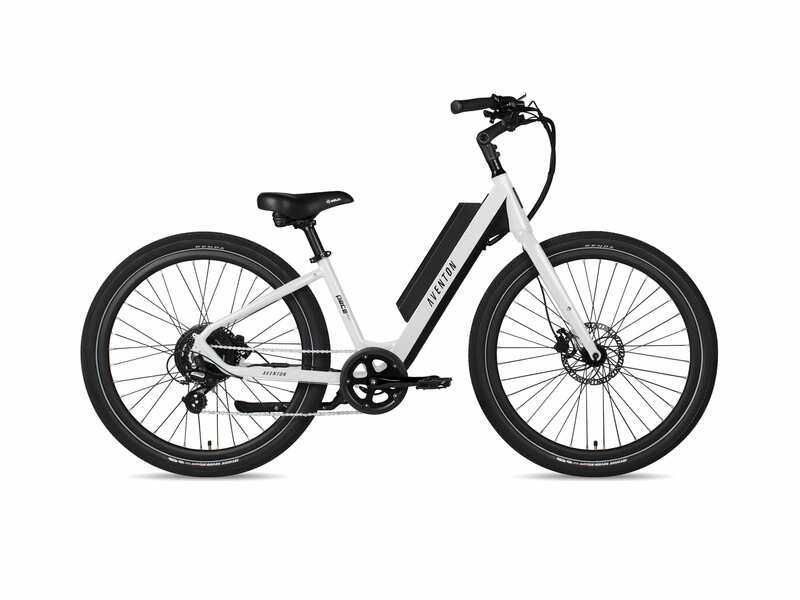 There are five e-assist and eight mechanical gears. In combination I have not found a hill in New England that we can’t handle. First a word about the Aventon people. They are great, easy to work with and understanding. I did experience some pilot error in assembling the Pace 500 and I feel so silly about it. The Aventon people arranged for me to visit a local retailer and the problem was all me and resolved in thirty-seconds. 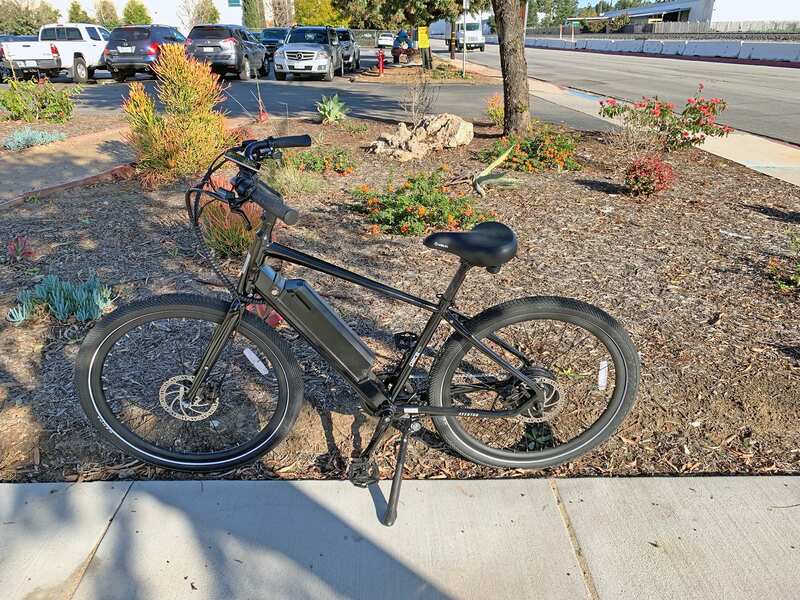 I was riding a flat section of route 9 below Oak Street at 12.3 MPH in mechanical gear 4 and e-assist 1. As the road rose up at about a 7-8% grade my speed dropped modestly to 10.8% and pedaling was at the same resistance. After three football fields the road leveled off. 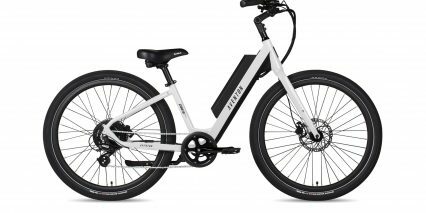 I have ridden at 27.2 MPH in e-assist level five a couple of times pushing the mechanical gear to 6 or 7. At my physical level (71 plus years) I did have to pedal fast to get to 27.2MPH. There was probably a little more performance in me but I was flying. I did not sweat, but it was about forty-two degrees each day. The acceleration each time you go e-assist is exceptional. Once in e-assist maintain tight control with your breaks until you have completed your turn or the acceleration will surprise you. The breaks clearly handle the higher speeds. Overall this is the most comfortable bike I have ridden. 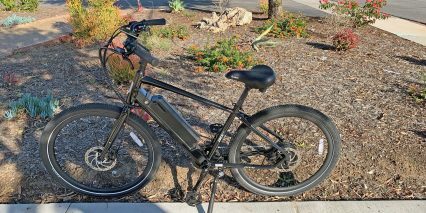 My hybrid is a Trek 7100 with front shocks and my road bike is a Cannondale Quick with a composite front fork. The Pace 500 rides like silk in comparison. For assembly support, try this video on YouTube from the company, which was helpful.